Most of us don’t want to lose our hair, but some of us will. Sometimes it’s genetic, sometimes it’s because we fall ill. No matter what the reason, we’re going to fight it. Lucky for us, there are many new products that slow down hair loss and even help it grow back. We’re going to review the best hair laser hair growth devices for home use. They use the power of light to encourage hair follicles to produce healthy strands. Laser hair regrowth is a painless process that takes time to work, but has been successful for many people. Do laser hair growth devices actually work? Yes, laser hair growth devices work. They have been proven to increase hair growth in clinical trials on both animals and humans. Your success in using one depends on your dedication to repeat the treatments as needed. You may also be able to speed things up if you use certain kinds of scalp treatments like shampoos, creams like Minoxidil or Propecia, and take diet supplements. Scalp massages are helpful to stimulate blood circulation, too. What kind of hair loss are laser devices best at treating? Those classifications describe thinning hair on the top of the scalp and a receding hairline. If you are nearly or completely bald, it may be too late for laser devices to help you regrow new hair because your hair follicles may have died. But if you see that your hair is beginning to recede and fall out, there is hope. Let’s begin our review with a hands-free device you can wear while you do other activities. The Capillus series of Laser Hair Growth Caps use low level light therapy (LLLT). Although their product name says “laser,” it’s not like industrial machines or even the lasers used to read DVDs. This is gentle light that penetrates into your skin to increase hair production at the cellular level. The 82 laser diodes (or LEDs) that are mounted around the interior of the cap send out light waves that are 650nm in size. This is the red-colored end of the visible light spectrum. It’s the perfect wavelength to reach the hair follicles in your skin. Red light speeds up the metabolism of skin cells and increases blood circulation. Each hair follicle receives more oxygen and more nutrients to keep them active. That helps hair grow thicker and stronger. It can also increase sebum and melanin production to make your hair feel silkier and look darker in color. Low Level Light Therapy was discovered in the 1960s. It’s been used to treat chronic pain and injuries as well as alopecia. In the past couple of decades, medical professionals on the American Board of Hair Restoration Surgery and the International Society of Hair Restoration Surgery have begun publicly speaking in behalf of LLLT as a viable treatment for hair loss. It is painless and has no adverse side effects. It works on both men and women regardless of skin or hair color. Capillus has obtained FDA clearance for their Laser Hair Growth Caps to be sold as medical devices. This means the FDA has reviewed information about the safety and efficacy of Capillus’ products. One of the reasons the Capillus hat is a popular product is that it’s very easy to use. It’s portable, too. Instead of making a trip to the doctor’s office two or three times a week for laser sessions, all you have to do is don the cap and wear it. The hat is powered by a lithium-ion battery pack that clips onto your belt or waistband. The cap itself is lightweight and comfortable to wear. You don’t have to mess with any settings or even remain still. Your hands are free so you can do normal daily activities like eating, light exercise, or commuting to work during the 30-minute sessions. The built-in timer shuts off the cap when your session is done. Should you remove the cap from your head during your treatment, it automatically puts your session on pause and beeps to remind you to finish your treatment. It’s true that the laser domes in a doctor’s office may be more powerful than the Capillus hair growth device. But you’re going to pay more, not just for treatments, but also for the cost of getting to and from the office along with all the time you spend traveling and waiting to be treated. Laser combs are another option for treating hair loss at home. If you have moderate to severe hair loss, these combs are probably not effective enough for your needs. Plus, you need to spend time brushing your hair with one for fifteen to thirty minutes a day. The Capillus device doesn’t require you to do anything more than put it on and turn it on. Its built-in timer will shut if off when your session is complete. How long does it take before hair begins to grow back? Capillus says that if you use the cap every other day for 30 minute sessions, you should see visible improvement in 12 to 24 weeks, or 3 to 6 months. They offer a 6-month money-back satisfaction guarantee. If you aren’t happy with the results you see within 6 months, you can get a refund. They also cover the device with a 1-year limited warranty. That includes the battery pack, not just the hat. Are there any special precautions the user needs to take while using the cap? The manufacturer recommends wearing the cap for one session every other day. Wearing it every day or for longer treatments doesn’t have any benefit at all. You can wear a different cap on top if you wish to disguise what you’re doing, or if you happen to desire protection against the rain or cold weather. The hair growth cap isn’t waterproof and should be protected from excessive exposure to water. If you need to clean it, gently wipe the inside with an alcohol wipe or a damp cloth. The Capillus Laser Cap comes with a rechargeable battery pack and clip, a power cord and AC adapter for recharging, plug adapters for international travel, a carrying case, and a user manual. The Capillus 82 hat is one-size-fits-most. Capillus makes another cap, the 272, which is available in an extra large size. The Capillus 202 has two and a half times the coverage of the Capillus 82 cap. That’s because it has 202 LEDs inside instead of 82. In clinical trials, it has a 95% success rate. Almost all of the test subjects grew one and a half times more hair in areas where it was thinning. This cap is otherwise similar to the Capillus 82. It is designed to be used every other day for 30-minute sessions each time. If you don’t see results in 6 months, it’s covered by a money-back satisfaction guarantee. While you are using the Capillus laser hair growth cap, you don’t need to use other products for it to work. But if you choose to supplement your treatment, they sell a line of hair care products to help your hair recover faster. The Conditioner contains Argan oil and other plant extracts to moisturize your hair and make it soft and shiny. The Activator is a spray-on formula made with peptide complex, antioxidants, and DHT blockers. The Revitalizer contains menthol, peppermint oil, and phytic acid to stimulate your scalp and reduce the pH, or acid levels. You’re impatient for your hair to grow, and that’s normal. That’s why Capillus offers Keratin Hair Fibers spray to give your hair a fuller appearance. Once you’ve washed your hair and it’s dry, you can spritz the Fibers and pat them into place. A quick pass with hair spray will give extra hold since you won’t be able to comb your hair afterward. The Keratin Hair Fibers come in several shades including black, brown, dark blonde, dark brown, light blonde, light brown, light gray, medium brown, and white. Now that we’ve covered Capillus, let’s move on to other laser hair growth devices. The Hair Restoration Laboratories' 200 Diode Low Level Laser Therapy Helmet is the most innovative laser helmet presently available. According to its manufacturer, it is the result of years of extensive research and development. This helmet is the only LLLT device presently available that provides its users a customized laser treatment in the specific areas in which the user is suffering from hair loss and/or thinning. Utilizing a free smartphone app (available for both Iphone and Android devices), the app allows the user to input a variety of information about his/her specific hair loss/thinning issues. The phone, utilizing bluetooth technology, then syncs with the helmet. The helmet has seven independent laser diode zones. Based upon the information provided by the user, and special sensors in the helmet, this helmet then provides a personalized hair loss laser treatment session in the area in which you need help the most. No other LLLT device offers this groundbreaking technology! Additionally, the helmet is an FDA-cleared product, which means it has been proven safe and appropriate for the treatment of hair loss. Another selling point of the product is that the rechargeable lithium battery is built into the helmet itself, so it is truly portable and you do not need to carry around a separate battery or bother with wires dangling from the helmet. Perhaps the best aspect of the Hair Restoration Laboratories' helmet? Despite its amazing technology and its guarantee to provide the best results of any LLLT device--it is remarkably priced for about 1/5 the cost of competitor laser helmets and caps. Finally, to provide you with peace of mind, the manufacturer offers a warranty that lasts for two full years, which is considered to be the best in the industry. For these reasons, the Hair Restoration Laboratories' 200 Diode Low Level Laser Therapy Helmet presently gets our highest recommendation. Like Capillus, iRestore has FDA-clearance on their laser hair growth helmet. It’s considered a safe medical device for home use. The iRestore does low level light therapy with 51 clinical-strength medical laser LEDs. That’s fewer than the Capillus cap. And while it’s a hands-free device, you are limited in what you can do during a session because you need to use electrical mains power to operate it. 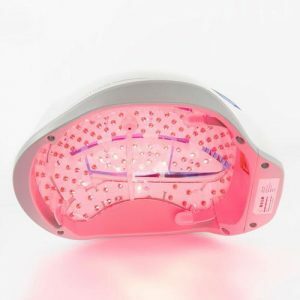 The LEDs use the 650nm wavelength of red light to speed up cell metabolism and reactivate hair follicles. Follicles go into a dormant phase and this causes hair to thin. The red light “wakes” them so that they begin to produce new hair. While you’re treating your hair with light therapy, you can also take vitamin and supplements, use hair restoration shampoos, and also apply topical treatments. Combining light therapy with another method usually speeds up the growth, and iRestore can be used with topical treatments or oral medications. If you are taking medications that increase your skin’s sensitivity to light (like some acne meds), double-check with your doctor before trying the iRestore. iRestore recommends using their system for 25 minutes, every other day. They offer a 6-month money-back guarantee so you can try it for a long enough time to see a change in hair growth. It typically needs to be used for at least 12 weeks, or 3 months. The person who founded the company called Theradome was a NASA scientist who wanted to stop his own hair loss. Their Hair Growth Helmet won FDA approval to be sold as a safe and effective medical device to treat hair loss. It works for both men and women. This helmet uses 678nm cold laser light from 80 individual lasers to reach hair follicles more effectively than LED light can. It’s rechargeable so it’s cordless just like the Capillus cap. You can wear it while you do light exercise or other activities. The manufacturer recommends two 20-minute sessions a week. In clinical trials, up to 97% of users saw their hair grow back to some degree. It works well enough that even Bosley and HairClub recommend it. The helmet is hands-free, of course, and can be adjusted to fit properly with the use of extra foam pads included in the box. If you prefer a hands-on approach, you may enjoy using the NutraStim Hair Regrowth Laser Hair Comb. It treats adult men and women suffering from androgenetic alopecia, or hereditary hair loss. There are twelve low level lasers embedded in the comb. After you wash and dry your hair, spend 8 minutes three times a week brushing your hair with it. Although it may take a few weeks to notice results, NutraStim recommends that you continue to use the Laser Comb to maintain growth. One note of warning: the lights are powerful and could damage your eyes. It’s recommended that you don’t stare at them, or even at their reflection in a mirror. If you aren’t satisfied with your hair’s recovery, NutraStim offers a no questions asked money-back guarantee. Q: What is DHT? Why do I need a DHT-blocker? A: DHT comes from the hormone testosterone. It causes hair follicles to shrink so that they make weaker hairs and finally quit working altogether. A DHT-blocker keeps DHT from affecting follicles. It won’t reverse the damage that’s already been done, but it can protect your follicles in the future. Q: What are DHT-blockers? Where can I get them? A: Zinc and saw palmetto are two of the best known DHT blocking ingredients that you can find in many shampoos that treat hair loss. Pumpkin seeds and green tea help, too. Q: Where can I learn more about Low Level Light Therapy? A: There are several medical studies posted online that you can read for free. Here’s one. While you’re using the power of red light to stimulate hair growth, it’s a great idea to use DHT blocker shampoos and conditioners. Plus, be gentle with your hair, both old and new growth deserve TLC. This popular shampoo contains PURA D’OR’s DHT blocker formula plus Argan oil to moisturize your hair. Other active ingredients include coconut derivatives, tea tree oil, elderberry, willow bark extract, black cumin seed oil, nettle leaf extract, green tea (also a DHT blocker), and sage oil. Apply and let it sit for two minutes before rinsing for maximum absorption into follicles. PURA D’OR recommends at least three months of daily use to see the best results from their shampoo. It’s safe for use on any hair type, even colored-treated hair. It does not contain sulfates or parabens. This is the conditioner that goes with the Pura D’Or shampoo above. The Pronexa shampoo is manufactured by HairGenics, a company registered with the FDA. It contains the DHT blocker saw palmetto as well as biotin, an ingredient that encourages hair growth. This is the conditioner that goes along with the Pronexa shampoo. It also contains saw palmetto to keep DHT from destroying your follicles. When your hair is already falling out faster than it’s growing in, you need a gentle hair brush that won’t cause more damage. The Beyond 100 Naturals bamboo brush is a well-made, durable tool that detangles hair and gently stimulates your scalp. It helps clear out dead skin cells so your laser hair growth and topical treatments penetrate down into the follicles. This is a soft hold hair spray for men and women. It adds a little bit of shine and can be reworked if you dampen your hair. It’s strong enough to hold a style all day but gentle enough to not rip out your hair when you brush it. If you’re worried that daily washes are ruining your hair, you can try dry hair shampoo. This one from Not Your Mother’s absorbs excess oil so you can skip a day or two. Hair loss is a sensitive subject. People spend lots of time and money trying to cure the problem. We want you to find the best products that will work for you so you don’t waste your precious resources. If you have hereditary hair loss, there is hope for you as long as it hasn’t gone on too long. You may feel silly treating the problem when you’re young, but now’s the time to start taking care of your hair. Once you are bald, your follicles may have died, leaving you without hope. It’s best to give them encouragement before the damage is permanent. If you’re not sure, make an appointment so a doctor can assess your situation. If you have temporary hair loss from a health problem or a side effect of medication, please follow through on any health care requirements you have. Consult with a medical professional about the possibility of using hair growth products. Generally speaking, low level light therapy products are safe for most adults to use. If you’re pregnant or taking a medication that makes you sensitive to light, check with your doctor before starting treatment. A laser hair growth helmet or cap is the perfect solution when you want to complete treatments at home or on the go without paying for expensive in-office sessions. The laser caps and hats don’t require you to do more than just wear them while they operate. Plus, they cover your whole head at once. While you may only have a small problem spot or two, it won’t hurt the rest of your hair to get the same treatment. A laser comb or brush treats a smaller area and requires you to actively use it, so it’s hard to do other activities during that time. You can supplement your laser hair treatment with DHT blocker shampoos, topical creams, vitamins, or herbs. Just be sure to check the contraindications and side effects of those other products. We hope you discovered the perfect laser hair growth treatment today. Although it may seem like a large investment at first, the cost you pay for this equipment up front is soon covered by what you would have paid to visit a doctor’s office for sessions. Plus, these top quality products we chose to review for you have money-back guarantees so you can try them without risk.